The pickup: Mounds of blushing apricots from farms east of the Cascade Mountains. 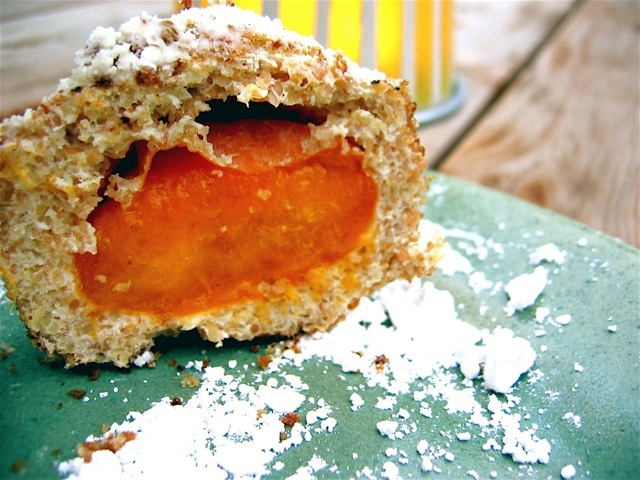 The results: Apricot dumplings, an annual treat. A friend taught me how to make them, and when a summer goes by and I haven't had a chance to make them, I always feel a slight pang of regret. The dumplings are essentially entire apricots (pits and all) wrapped in a dense, unsweetened dough, boiled like gnocchi until they float, pan-fried for a bit, then served warm with powdered sugar on top. They make a lovely dessert on a warm summer evening, especially if served with an apricot-perfumed bottle of Riesling. They're big, so you probably won't pop one into your mouth whole — but if you do, watch out for the pit.